Life surely hasn't slowed down simply because the season changed and the temperatures rose, which leads me to wonder-- whatever happened to the lazy days of summer? While the breakneck pace of life will continue this weekend, I am hoping to find moments of stillness and calm in the midst of the go-go-go. I hope your weekend holds those same quiet moments too. i wish the temps would rise here. it's been such a cool chicago summer. i don't get it. i've never known such a cold july. it's crazy! thanks for your sweet words and encouragement on my etsy post. Hmm... maybe you need a hammocl for the days to get lazy! Either way, I need one. Happy weekend! 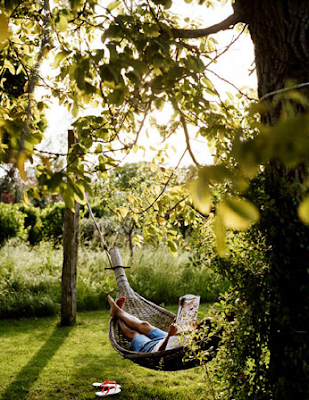 One day I will have the perfect hammock to read in...one day! I'm so glad it's not just me! Though I hope we both feel better soon. 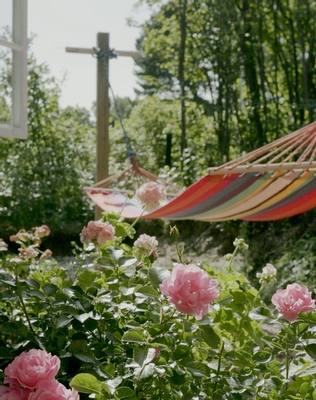 A day in a hammock would surely help - these images are delectable. I love hammacks. They just give off that cool, relaxed vibe. We have one in the backyard and the kids love it! I just recently started my Blog. I'd love for you to come by for a visit if you get a chance and say hi! I stumbled into ur blog as I was surfing for new curtains for my rented place. I like ur blog very much as I am interested in design and beautiful things. I'm not very creative with designing myself but I always like to see pretty things. Definitely will bookmark ur site. I am definitely not ready to forgo the lazy days of summer....Happy weekend, xv. Such a perfect prescription! 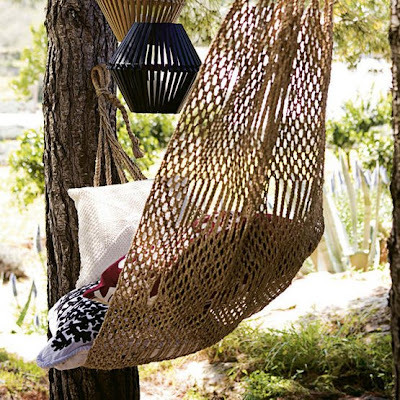 We all need a hammock day, don't we? Wishing you a lazy weekend! These photos are great--perfect for lazing around on the weekend. Which is exactly what I'm doing today. Hope you're having a great summer too! I'm wondering the same things! I have deadlines and events and a to-do list a mile long. I thought this was summer?? AND I'm not even working right now! But life is good and I'm taking the change of pace to mean things are picking up for everyone, which has to be good news...right? Hope all is well! Oh how I wish I had a hammock right about now. Great summer photos! Hope you had a great relaxing weekend! this is so true - i think lazy days of summer is for kids haha because now that i'm 'grown up' i dont see them anymore! 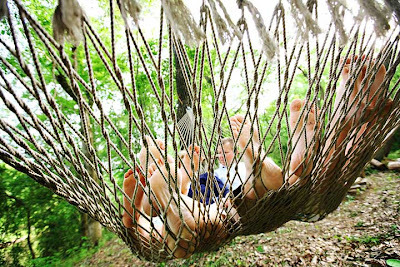 but maybe i need to make time because the hammocks look awesome! I am still looking for the lazy days! I certainly have NOT had enough lazy days this summer. I want a hammock!! We have an old cotton hammock that I love hanging out in. it's one of those hammocks that wraps you up like a tamale, and I LOVE it. hope you had a great weekend! I can't tell you how much I look forward to your weekly comments. Oh I miss summer vacation! Hammocks! This reminds me of being a little girl (like in my picture) and swaying back and forth in the breeze in the crisp summers in Michigan. Thanks for those neat pictures! You made my day! This is going to sound ridiculous, but that's okay. Hammocks stress me out. lol. I have terrible balance so I can never really get comfortable in a hammock. So I'm always either in a chair or stretching out on the ground. 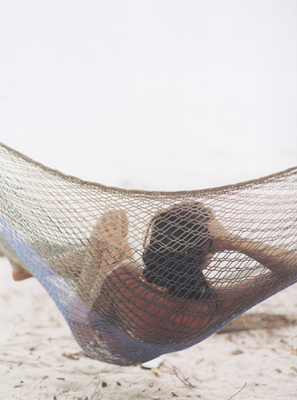 I'm craving for a hammock right now! I've worked in wedding and event floral design for the past five years, but as my husband is in the midst of a career change, so might I find am I. Regardless of what path we end up taking, this blog will serve as my outlet for all things creative- home interiors, weddings, fashion, etc. I want to give credit where credit is due; please tell me if you know the source of a photo I haven't linked or credited. If you are the owner of a photo I've used and would like me to remove it, please contact me and I'll do so. Also, if you find something here you would like to borrow, please don't hesitate. I simply ask you give proper attribution. Thanks!